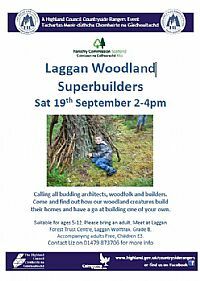 Lots going on at Laggan Forest Trust over the next few months. Click on the picture to find out about the events happening this autumn. Calling all budding architects, woodfolk and builders. Come and find out how our woodland creatures build their homes and have a go at building one of your own.